To find the most suitable grass selections for your region, locate your Grass Zone in the map of the 48 contiguous United States, then correlate it with the description below. The general weather characteristics of this zone is that of cold winters and warm or hot summer conditions. Rainfall typically occurs with regular intervals, even during the summer months, but there are occasional periods of drought. The cool season grasses will tolerate some extended periods of drought by going dormant. Cool Season Grasses grow the most during the spring and fall months and prefer temperatures ranging from 65-80° F. For best results, Cool Season Grass species are often found in grass mixes, together, instead of planted as an individual species. 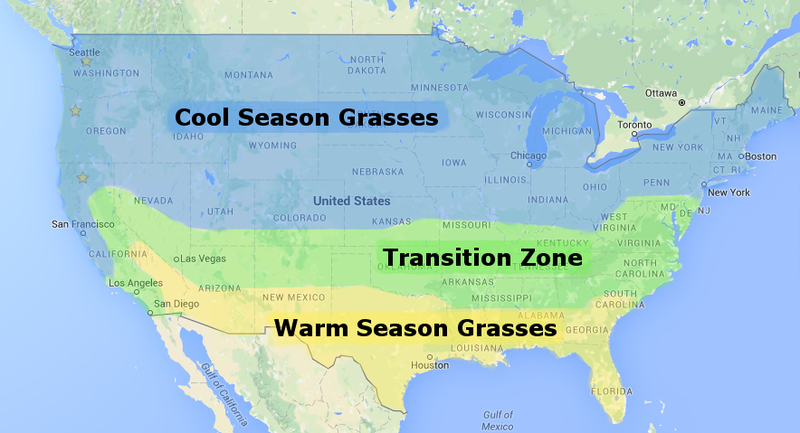 The Transition Zone extends from coast to coast, as an overlapping region, represented by a band on the map between the Cool Season and Warm Season Grasses. In general, the Transition Zone often has very dry and hot summers with cold winter months. The best grass choices for Transition Zone areas can tolerate a combination of climate conditions. If a Warm Season Grass is planted, it will often go dormant and turn brown during the winter months or when the temperatures are frequently below 60° F.
***NOTE: We do not grow any Warm Season Grass species in Oregon, so please locate your local grass seed supplier or home & garden center if you live in the southern United States. This zone consists of the southern states which have cool winters and have hot summer months. With origins in the sub-tropics, the Warm Season Grasses all grow and thrive during the summer months when temperature are ideally 75-90° F. When the cooler temperatures arrive, nearly all of the Warm Season Grasses will brown in color because they go dormant during the winter. For this reason, it is commonly a good idea to winter overseed with either Perennial Ryegrass or Annual Ryegrass to keep the lawn looking nice and green.